On a summer day when the deep-blue water is filled with water-skiers, motorboats and kayaks, it’s hard to think of Lake Tahoe as anything but peaceful. Seitz, who works for the California Geological Survey, has been studying Tahoe’s faults since 1999. If he has a bit more urgency than you’d expect for someone studying a once-every-four millennia event, that’s because the last big quake happened, well, about 4,000 years ago. On Thursday afternoon, Seitz stood on a barge about 300 yards off the lake’s west shore. 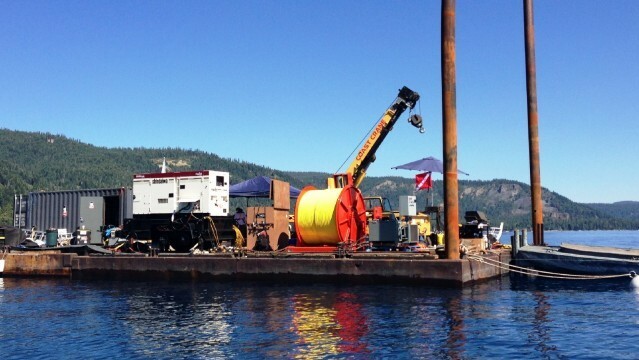 The barge is the operating base for a robotic submarine that is spending the week about a thousand feet below the lake’s surface, using high-definition cameras and ultrasound-like technology to examine the West Tahoe Fault. At this point, evidence suggests the last quake had a magnitude of 7.1 to 7.4. “Usually, the last earthquake gives you the best picture of what the next earthquake will be doing,” Seitz said. The Tahoe barge is packed with cables, a crane, a generator and even a propane grill. In a metal shed, scientists monitor video feeds from the sub, along with data showing the machine’s depth, along with the temperature, oxygen and saline levels of the water. The Tahoe dives are a tune-up for the submarine and its Northern Illinois University crew. Their ultimate destination is Antarctica, where the sub will dive under ice shelves to conduct climate change-related research. So in addition to providing data for California researchers, the crew is working out kinks. Among them: a small leak that left the sub temporarily grounded when reporters visited the barge. Exactly the type of problem that’s easier to fix on a sunny Lake Tahoe day than deep below an Antarctic ice shelf.